Use the familiar interface in working with Word 2007, 2010, 2013, 2016, 2019 and 365 if you have Classic Menu for Word installed. Just take Microsoft Word 2010 for example. With Classic Menu for Word 2007/2010/2013/2016/2019 installed, you can click Menus tab to get back the classic style interface. The Help menu lies in the right most of the toolbar. 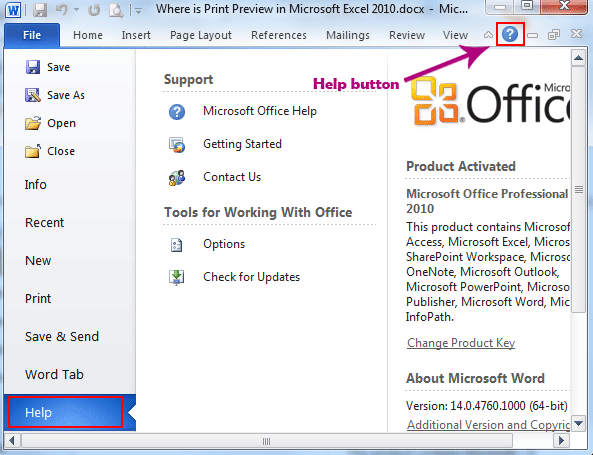 The Help button in Word is too small that will be easily ignored. Actually the Help button stays in the top right corner of the window. The button looks like a question mark surrounded by a circle. The following picture shows its position. Or you can use the shortcut key F1 to enable the Help window. The Help menu has been added into the Word 2010 backstage. Click File, and you can find Help in the pane.